Butter Chicken is my kids favourite Indian recipe. Here is a restaurant style butter chicken you can easily make at home. This authentic Murg Makhani is delicious, easy to make and great for special weekend lunch. Murg means Chicken and Makhani means buttery/creamy so this decadent dish is a great way to impress your sweetheart this Valentines Day. Now if you are a butter chicken aficionado then here are few of our other tasty recipes that you must try. – Marinade the chicken for 20 mins atleast. Longer the better. – When ready to cook, first prepare the sauce by adding all ingredients as shown in the video. Then blend them to get silky smooth consistency. Cook chicken and combine the two. Finish off with dried fenugreek leaves and enjoy over rice. 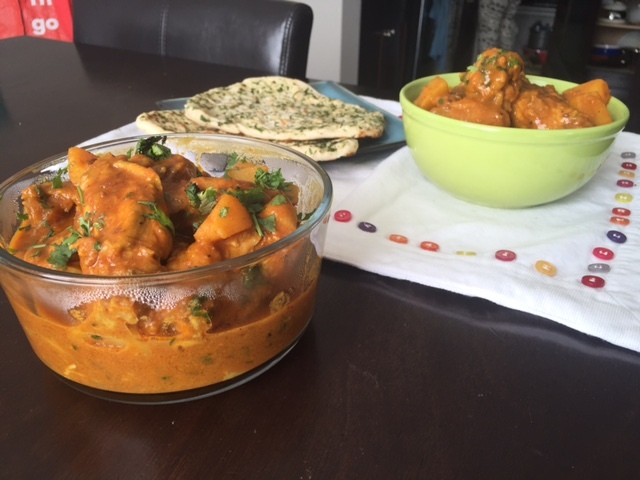 Quick Easy and tasty Chicken Masala Curry is a perfect dish for a weeknight meal and can be served with rice or roti. – Cut chicken in bite size pieces. Make tomato puree. – Heat oil in a pan and fry mustard/cumin for 30 secs. — Add onions and mix well. Add garlic. – Add chicken. Mix well. – Add tomato puree. Mix well. – Add curry powder and water. Let chicken simmer in curry. – Finish by adding ginger and cilantro. Mix well. – Fry spices with onions and ginger garlic. Add corn and potatoes. Mix well. Add tomatoes and cook until tender. Add Curry powder. Water if required and cook until curry dish is ready.